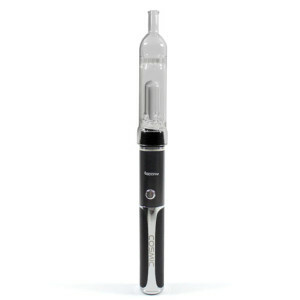 New from Vaporite, a company that typically makes conduction style vape pens, is the Cosmic. 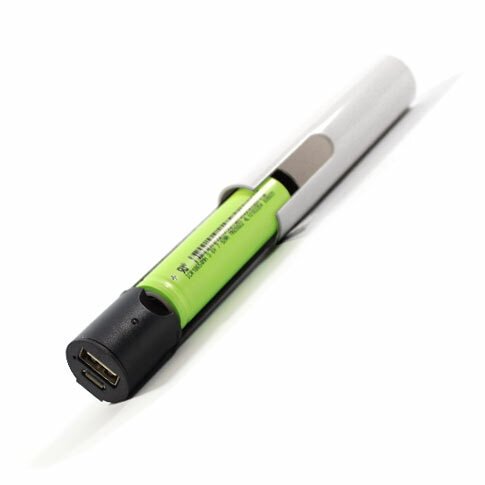 While this unit may look like a pen-style vape, it actually functions as a true vaporizer. The cosmic boasts some cool features (Bluetooth compatability) and includes some nice extras (water filtration tool and power bank), so let’s see what it’s all about. The Cosmic is essentially a re-branded Atmos Orbit, however, that’s not to say it doesn’t look good. Leather grips on the base are accented by chrome trim, giving this unit a touch of class and a luxurious feel. The Cosmic features a rubber mouthpiece that must be removed to secure the included water filtration device. All things considered, the aesthetic value of the Cosmic is probably one of its biggest selling points. The one thing I don’t really like about the look of this unit is its sheer size. For a portable, it’s quite large, and not necessarily something you’ll be able to stick in your pocket and run out the door with. The Cosmic allows you to choose between 3 selectable heat settings: Level (Blue): 320°, Level 2 (Green): 356°, Level 3 (Red): 428°F. To turn the unit on, you click the power button five times. To activate the heating element, press the button three times. Once activated, the unit will default to its Level 2 (Green) setting, which is 356°F. To cycle through the temperature settings, press the power button three more times. I’m not a huge fan of this type of temperature selection method, as I much prefer a digital readout of some sort to eliminate confusion. Taking a page out of Storz & Bickel’s playbook (manufacturer of Volcano products), Vaporite got ‘Crafty’ (see what I did there?) 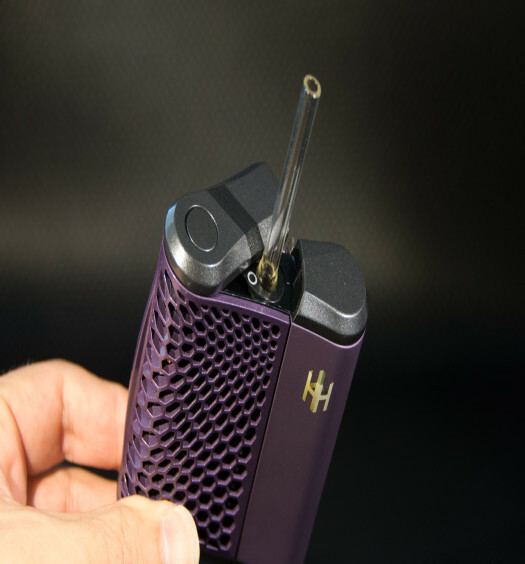 and included a pretty cool little feature with the Cosmic: Bluetooth capability and a downloadable App which allows you to sync your vaporizer to your smartphone and adjust temperature remotely, monitor how much and often you vape, as well as the intensity of your sessions. The App also gives you real-time feedback, puff records and tells you if you could be using the Cosmic more efficiently. Now, being able to quantify your vape sessions and get precise metrics is probably not entirely necessary, but is a pretty cool feature nonetheless. While hydrotube accessories are nothing new, it’s pretty rare to see one included with the unit itself without jacking the price up (the Pinnacle Pro DLX Kit costs an additional $50). The Cosmic comes equipped with a high quality glass water adapter at no additional charge, giving you the ability to enhance the already ultra-smooth vapor being produced and cooling it through water filtration. I’m a big fan of water adapters and use them often when I vaporize (I recently purchased a rig for my Arizer Air which hits like a dream). Again, at the risk of sounding like a Vaporite fanboy (which I assure you I am NOT), I think the addition of the hydrotube with the Cosmic was a really smart move on their part, making an already attractive package even more irresistible. My only gripe (pretty much about the entire unit) is the way the hydrotube sits on the unit. It’s not the most secure fit I’ve ever seen. It’s almost certain to fall off at some point, which is sure to be a bummer. Something pretty cool and unique about the Cosmic is that an external power bank is included with the unit. This gives you the ability to charge-up the replaceable battery and power bank when you’re near a power source, then continue charging once you’re on-the-go with that built up juice. I like that Vaporite included this with the unit, and not as something additional you have to purchase. Operating the Cosmic is pretty straight forward. Just detach the mouthpiece and place some finely ground herbs into the generously sized heating chamber and select your desired heat setting. I chose the MID setting (356°F) for my session, and found the Cosmic to produce some decent clouds. However, I felt like I was really having to work for my hits, which was kind of annoying. The $100 – $200 price range is pretty competitive among portable herbal vaporizers, and although there’s nothing inherently horrible about the Cosmic, I can think of about 10 other portables I would recommend before this unit. However, the included water filtration tool and external power bank are nice features, and something you won’t find included with most other portables. If you find yourself unable to resist the allure of the Cosmic, you can purchase one from the vaporizer retailer I typically recommend, as well as another trusted store that I’ve purchased vapes and accessories from in the past. Considering what you’re getting with the Cosmic (a water filtration tool, Bluetooth capability, as well as an external power bank), the price tag doesn’t seem horrible. The build quality seems good, and the vapor production isn’t horrible. If you’re dead set on staying below the $150 mark, then the Cosmic is a good option. This company is a joke – I ordered one and didn’t receive anything, then I finally found a number and they sent it via Netherland post . It finally showed up without a usb cable and not properly packaged and they refused to return it for me when it didn’t work! Don’t even think about ordering through them. You said you would recommend 10 other vapes before this one, which ones are they? I’m trying to spend under $200 for one, but am not sure which one to buy. I recently tried the pinnacle pro and i do like it so far. I’m new to vaping but excited to start. For under $200, I could recommend the following: DaVinci Ascent, Goboof Alfa, Arizer Solo and Vapium Summit – all of which are portable vapes, and all perform very nicely for under $200 (and are exponentially better than the Pinnacle Pro and Cosmic). Or, I’d also recommend spending a little more and getting yourself a Vapir Prima or Pax 2. Both are great values at around $260.